You've gotta love being the new guy. This little clip from Man Stroke Woman is what will most likely happen to you on your first day with your new job. 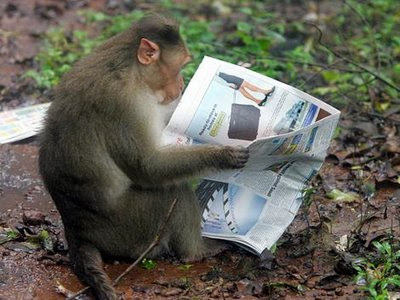 As it turns out, monkeys are smarter than us. And apes are way beyond us. The proof is in the pudding. This chimp's name is Bart. He runs a grocery store that employs seven illegal immigrants and three high school kids. The incentives for employees are food fights on breaks, and finger painting for an hour two times a week. He also is very generous with bonuses, paying his top employees in banana creme pies and lower back massages. This next photo is Phil. Phil is a newspaper editor. Here he can be seen checking reading an advertisement that was placed perpendicularly to the text. He is not just literate, but extremely meticulous with his reading, often reading 50 articles before lunch, with only two percent of those making the final cut. Our last smart ape is Bobby. He lives in Borneo and likes to go stick fishing. 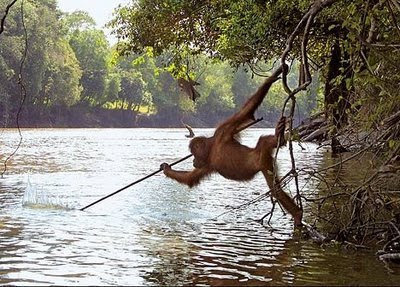 It is similar to spear fishing but less invasive to the fish. Bobby actually smacks the fish upside the head before catching them, thus stunning them. The typical spear fisherman causes irreparable bodily harm to the fish before catching it. Good job Bobby. Is Your Cat a Pirate?